Facultad de Ciencias, Universidad de Valparaíso (2006-present). Genetic and environmental regulation of neurogenesis in the olfactory and neuroendocrine system of zebrafish (Danio rerio). The ability to regenerate neurons in adulthood occurs in a limited population of neurons in the nervous system, the most notable being the olfactory system. 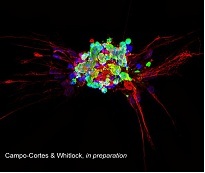 We use the olfactory sensory system to understand the genetic control of neural precursor selection in early development and in regenerative plasticity as adults. In addition to the intrinsically expressed genes controlling development and regeneration, the environment plays a role in the selection and maintenance of gene expression. An olfactory sensory neuron expresses a single olfactory receptor which must be selected from 100-1000 genes coding for olfactory receptors. Odor experience plays role in modulating the gene expression within the olfactory sensory system and including receptor expression. Originally the olfactory sensory system was proposed to be a source of the neuroendocrine Gonadotropin Releasing-Hormone (GnRH) cells essential for puberty. In humans, the loss of endocrine GnRH cells results in developmental defects including the lack of initiation of puberty and infertility. We have used genetic, molecular and imaging techniques to show that the endocrine GnRH cells arise from regions outside the olfactory sensory system, and that the adult hypothalamus has the ability to generate new GnRH cells thus opening the door to therapeutic treatment of human disease. The transcription factor Six4b:mCherry (red) is not expressed in differentiated neuronal sub-types in the olfactory epithelia. (A, B) Microvillar sensory neurons (green) lie apical to the Six4b:mCherry expressing cells (red) and do not co-express Six4b:mCherry (B; arrowhead). (C, D) Ciliated sensory neurons (green) are distributed throughout the olfactory epithelia and do not co-express Six4b:mCherry (D, arrowhead). For more information see Harden MV, Pereiro L, Ramialison M, Wittbrodt J, Prasad MK, McCallion AS, Whitlock KE (2012). The cranial neural crest cells (green) forming the structure elements and glia of the olfactory sensory system, are sensitive to alcohol which affects the migration of the precursors. Defects iin cell migration results in phenotypres similar to those observed in human fetal alcohol syndrome (Boric et. al. in peparation). 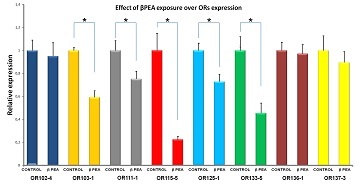 We have demonstrated that zebrafish can make and retain olfactory memories of odors experienced as juveniles, and this odor exposure results in changes in gene expression in particular the otx2. Recently we have shown that ORs containing putative otx2-binding sites can be differentially regulated in response to odors (Calfun & Whitlock, in preparation). Recently we have derived neurospheres from the adult hypothalamus. Upon differentiation these neurospheres generate not only neurons and glia but also GnRH cells showing that the adult hypothalamus has a quiescent population of stem cells able to generate these essential endocrine cells (Cortes-Campo & Whitlock, in preparation). Harden MV, Pereiro L, Ramialison M, Wittbrodt J, Prasad MK, McCallion AS, Whitlock KE. (2012) Close association of olfactory placode precursors and cranial neural crest cells does not predestine cell mixing. Dev Dyn. 241(7):1143-54. Stephenson JF, Partridge JC, Whitlock KE. 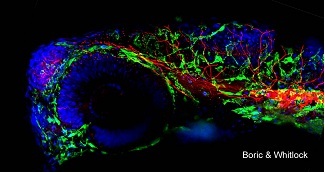 (2012) Food and Conspecific Chemical Cues Modify Visual Behavior of Zebrafish, Danio rerio. Zebrafish. 9(2):68-73. Flanagan CA, Chen CC, Coetsee M, Mamputha S, Whitlock KE, Bredenkamp N, Grosenick L, Fernald RD, Illing N. (2007) Expression, structure, function, and evolution of gonadotropin-releasing hormone (GnRH) receptors GnRH-R1SHS and GnRH-R2PEY in the teleost, Astatotilapia burtoni. Endocrinology. 148(10):5060-71. Harden MV, Newton LA, Lloyd RC, Whitlock KE. (2006). Olfactory imprinting is correlated with changes in gene expression in the olfactory epithelia of the zebrafish. 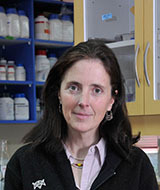 J Neurobiol. 66(13):1452-66. Whitlock KE, Illing N, Brideau NJ, Smith KM, Twomey S. (2006). Development of GnRH cells: Setting the stage for puberty. Mol Cell Endocrinol. 254-255:39-50.